Penned Without Ink: Look at the Birds . . . I've been watching them since last fall when, for the first time, I planted a shepherd's crook outside my front window and hung a bird feeder. 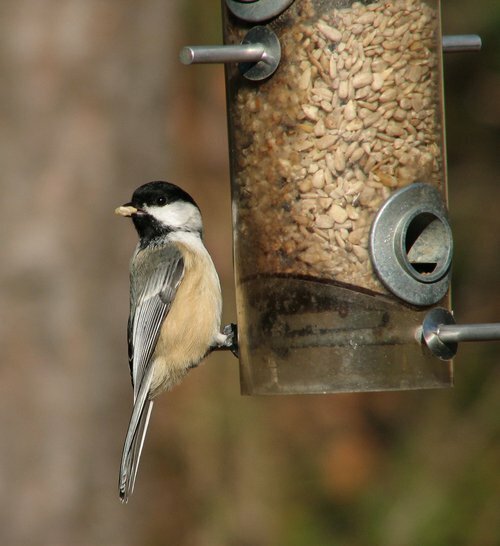 There's a quiet joy watching these little creatures up close, flitting and swooping and eating. Every week I fill up the tube, and every day I see how much they've eaten. Now my late husband was a real birder. Even after giving multiple bird books away, we still have enough to fill a library shelf along with several pairs of binoculars. He joined the Audubon Society and took regular bird walks. He practiced learning the calls and songs of the local birds. Sometimes he took the girls with him on his birding trips, where they not only learned about various birds but also plants and flowers. 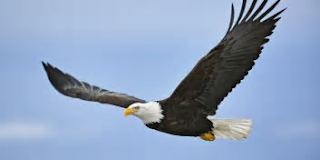 One day he and I got a close-up look at an eagle flying over our heads. 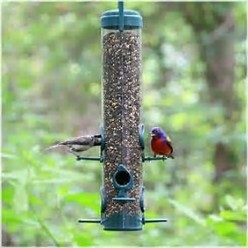 Look at the birds of the air: they neither sow nor reap nor gather into barns, and yet your heavenly Father feeds them. Are you not of more value than they? . . . Therefore do not be anxious . . .
Jesus, the ultimate story teller, knew how to take the common everyday things of life and draw spiritual truth from them. These constant reminders have a wonderful way of giving us perspective and inviting us to trust Him. So, whether you're a real birder or just a novice like me, there's hope to be found in nature's object lessons all around us. Just look at the birds! This past week, I looked out our front window and a shadow crossed tree trunks, catching my eye. I wondered, "What produced that?" I looked up and 3 huge dark birds circled effortlessly. They had white heads. Eagles! Three of them! Over my glade! They spiraled up and then flew over the wooded hill behind my house. God blessed me with an inspiring reminder of Him. Wow! What a memorable moment, Lisa. Thanks for this simple yet thought provoking reminder of God's love and provision. It was a blessing for me to read this morning. Thanks, Cheryl. God reminds us of His faithfulness in simple ways . . . I love bird watching and remember learning a thing or two from Barry anout birds native to our area. Its marvellous how God reveals Himself and His truths through creation. Thanks, Julie. I think Barry would have enjoyed watching the birds this past winter. We have a feeder outside the dining room window, but the birds seem to like the front better, probably because of the bushes that provide protection. Perhaps there's a lesson in that, too.